You are here: Home » GENRE » Humour » Star Wars: Star Destroyer Halloween costume wins – just wins. 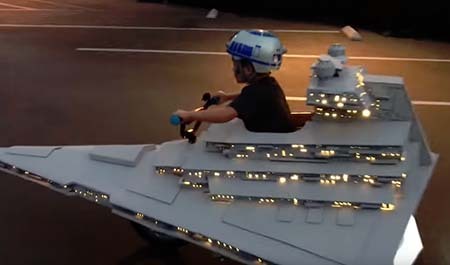 Star Wars: Star Destroyer Halloween costume wins – just wins. Andrew sent in word that after many months of gluing and painting, his Star Wars Star Destroyer costume was finished just in time for his kid’s Halloween. It comes equipped with a speaker to blare out the Imperial March, if it wasn’t cool enough already. « Spies in Disguise (spy-fy movie trailer).